Simms: Tell us a little bit about your art background? Keeler: Sure. I have what I’d consider to be a strong formal arts background. I’ve got a bachelors in studio arts and a masters in fine arts in painting and drawing. Simms: Obviously, you have an extremely distinctive style. How did that develop? Keeler: I grew up listening to heavy metal and was always really interested in fantasy art, Dungeons and Dragons and things like that. I was also heavily influence by graffiti, skateboard graphics, and album artwork. Take all of that, meaning my upbringing, my interests and my formal training, and that kind of spits out my style. Simms: How about in terms of the subject matter? Keeler: Again, because I was so into heavy metal and fantasy, skulls and skeletons ended up appearing in pretty much all of my artwork. Simms: So how did that merge with your passion for fishing? 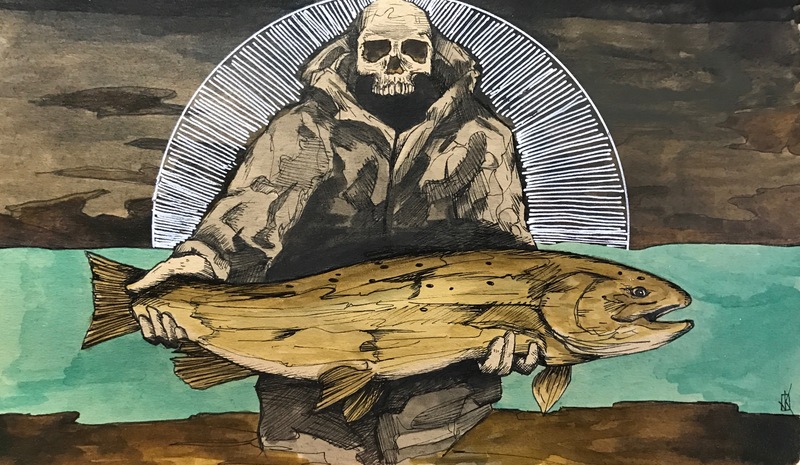 The combo of skulls, skeletons and fly fishing isn’t exactly an obvious blend but somehow, in your art, it really works. Keeler: Yeah, it was kind of weird. A friend of mine asked me to do a drawing of a fish. At the time, I don’t think I had ever drawn a fish, maybe when I was a kid or something. He wanted a rainbow trout and asked me to draw it in my style. So I did it and was like, why have I not been drawing fish all along. I really had so much fun because it tied my love of fishing in with my passion for art. I continued doing my skulls and things like that but I was doing more and more fish pieces as well. At the time, it was like I had two bodies of work. And I thought, you know, I want to have one body of work so how can I merge these? I was seeing a lot of commissioned artwork out there of people holding fish and I was like, man, I’d love to do that except I’ll make the people into demons and necromancers and things like that. When I sat down and did it, I was like, yeah! This is exactly what I want to see and I’ve just been at it ever since. Simms: Are most of your pieces referenced from images? Keeler: Not necessarily. I really kind of try and tap into again, the fantasy of the experience. I really look at it like much like my own fishing memories. You know, they are never accurate. They are full of exaggerations, misinterpretations, or emotions or psychological states that inform what you actually remember and what actually happened. That’s more of what you see on the surface of the artwork I create but it could be anybody – you, me, some fantastical character so it really reflects back on the viewer. That’s how I look at it anyways. Simms: So it’s a lot like music. The lyrics and music of a song might mean one thing to one person and something completely different to another? Keeler: Exactly. As artists, whether it’s music or visual arts, we kind of set the guide poles but leave it to the viewer or listener to create their own stores around the art they see or music they hear. 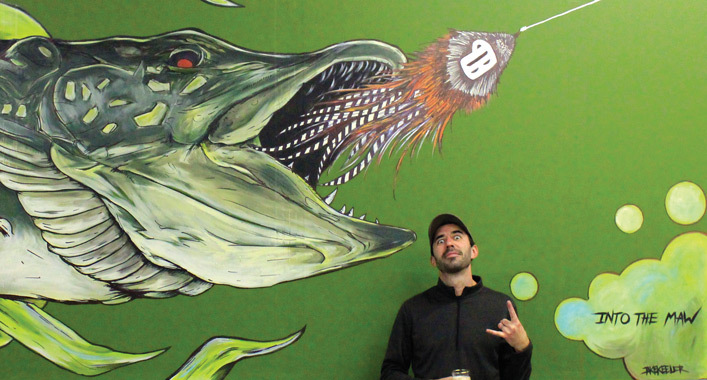 Simms: Now that we’ve chatted a bit about your art background, how about your fishing background? Keeler: Like most of us, I got into fishing through my dad and I guess a bit from my older brother. We fished pretty much year round. Even in the winter, we were ice fishing. It was really a way of life, it wasn’t a hobby or a random activity, it’s just what we did, it was our identity. We also did a lot of hunting. As a matter of fact, in my earlier years, I was more into hunting then fishing. When I started fly fishing however, it was all over. All of the sudden, I didn’t own decoys and the shotgun sat in the safe, it was all about fishing from that point on. Simms: How did that transition happen? Keeler: Oh, I guess it was maybe 11 or 12 years ago, long enough for me to feel like I’m pretty well invested into it. A couple buddies of mine who were really into fly fishing invited me to fish with them on the Rush River. We hit a massive sulpher hatch and the fishing was so good and so visual, that was it. Simms: What is it about fly fishing that made you want to drop everything and basically dedicate your fishing endeavors to fly? Keeler: I’ve been asked that question a lot and here’s how I like to answer it. Fly fishing really reconnected me to the emotions and experiences I had when I was a kid when I was fishing. Fly fishing forces you to pay more attention to the water, it forces you to pay closer attention to the weather, to the conditions, to the bugs, to everything, all of the sudden, it’s like being a kid again. It’s that focus and sense of discovery it offers that sucked me in. Simms: You mentioned that you were into fantasy novels, Dungeons and Dragons and things like that because in a sense they took you away to these imaginary worlds and allowed you to escape. 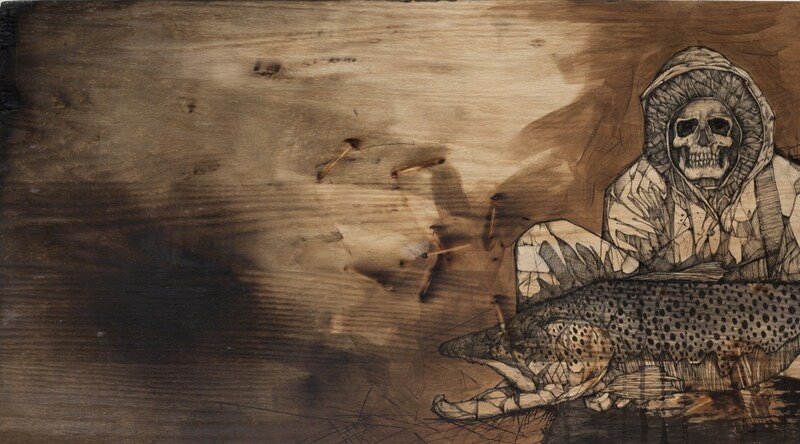 I would imagine art allows an escape into your own little world as well, does fishing offer the same escape? Keeler: Absolutely – at least for me it does. The practice of making art in the moment and the practice of fly fishing in the moment are one in the same for me. It’s the same mental space, it’s the same emotional space, physiological space. Everything around it, the training, experience, prepping, it’s thinking about how you will do it better while you’re not doing it. Then, when you are in the moment and you are doing it, your focused on execution and nothing else. Whether it’s art or fishing, it’s the same. Simms: Being from Minnesota, in your mind, what is it about the Boundary Waters that makes it worthy of protecting? Keeler: We are lucky to have many special places in this country and the Boundary Waters is certainly one of them. The Boundary Waters is one of those places, when you go there, you feel like it’s not that much different from what it was hundreds or even thousands of years ago, it allows you to completely lose yourself. You get the sense that you are no longer connected to society, or history, or the future, once again, you are in the moment. Unfortunately, as a society, I think at times, we don’t put enough value on these special places that have these special qualities. That’s why we need to treat them differently, we need to protect them because if they go away, they’re gone for good. You know, it would be different if someone say, ‘hey the cure for cancer is up there and in order to get it, we need to chop down these woods or drain this lake.’ Well, then, it’s like ok, lets weigh the pros and cons because perhaps the pros might outweigh the cons. But in my mind, when it comes to something like a mine – go freakin’ build your mine somewhere else. The Boundary Waters is too special of a place to put at risk. They say it’ll create all these jobs but what’s the cost? How many jobs that rely on the resource will be destroyed if the resource is compromised. 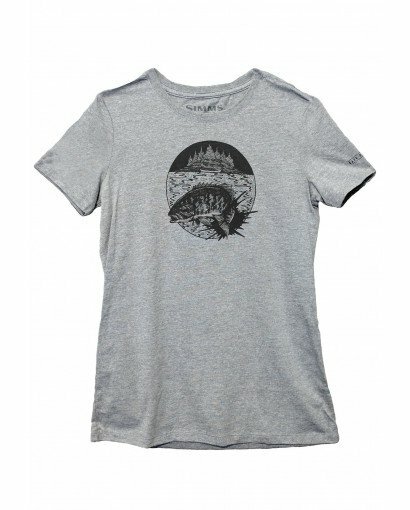 Simms: How does it make you feel as a Minnesota native to have the opportunity to design the SOS Boundary Waters T-Shirt? Keeler: It was such an honor to say the least to not only contribute to protecting the Boundary Waters but also to serve in a way as a representative of Minnesota. I had already made a commitment to put more effort towards conservation initiatives and supporting non-profits by donating at least 30% of the revenue I make from my artwork back to organizations who are doing clean water initiative work so it was really a perfect fit. Like most artists, I don’t want my work to only be a vehicle for me to express my ideas and to have a creative outlet, I want it to serve a larger purpose. Topic(s) Boundary Waters, Jake Keeler, Save Our Streams by John Frazier. Bookmark the permalink. Rock on, in every sense of the phrase, Jake Keeler and Simms! Thanks for getting involved with the effort to protect the Boundary Waters. 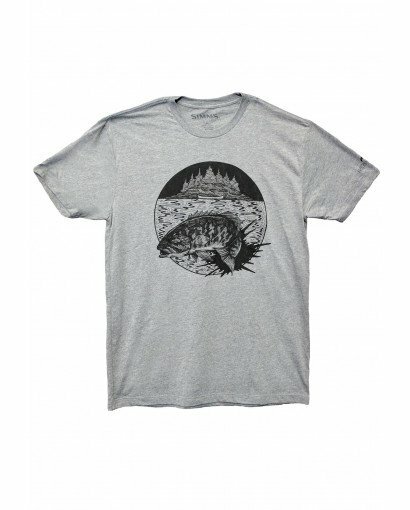 From a native Minnesotan who spent many a day in my youth on lakes in the Boundary Waters with the family unit…camping, portaging, fishing, berry picking, swimming, and enjoying the good life. We need to fight to keep that available for this and future generations!